Come and join our Malvern Little Star Summer Camp this July 2018. Three separate weekly sessions in either morning or afternoon to give you maximum flexibility. This Summer Camp is a great opportunity for children to develop their communication and language skills. You can rest assured that your child will be in good hands; learning from teachers, coaches and experts while making new friends during this July Summer holiday break. Our Camp is run by an outside provider E.L.S.A. (part of Dunn’s Education). The Fee for this Camp is $3900 HKD each session per week. 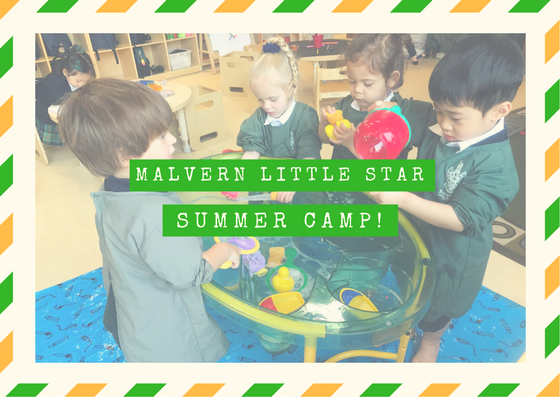 If you would like to join our Malvern Little Star Summer Camp, please register via office@malvernpreschool.hk and send in a cheque payable to ‘Malvern College Pre-School Limited’ on or before 8 June 2018. Please note that registration is on a first come first served basis and space is limited. Children who do not attend MCPS are also invited to enrol but priority will be given to existing MCPS students. We look forward to you joining us over the summer vacation! Malvern College Pre-School Island West is applying to the Education Bureau for school registration. Meanwhile, the renovation of the school premise is in progress. Prospective parents should take note that all offers for admissions are conditional on the issuance of a certificate of provisional registration.